Quality of consciousness has been regarded as the essence of well-being in spiritual, philosophical, and psychological traditions for more than two millennia. [1,2] The roots of mindfulness lie in Eastern religious traditions such as Buddhism, that have emphasised the cultivation of one’s consciousness actively through meditative practices as a mean to achieve spirituality. This unique presence in the present moment is brought about by techniques that expose the individual to the ever changing experience of his/her thoughts, feelings, and sensations, both bodily and external with awareness and acceptance. The principles of mindfulness are being increasingly utilised in modern clinical psychology, often in combination with cognitive behavioural interventions. Mindfulness techniques have been successfully incorporated in standard psychotherapeutic interventions, including stress reduction, cognitive therapy, dialectical behaviour therapy, and acceptance and commitment therapy. [5-8] Gotink et al., in a meta-analysis of randomised controlled trials, concluded that there is evidence to support the use of mindfulness programmes to alleviate symptoms of a variety of mental and physical disorders. Mindfulness training has also been shown to improve a host of general well-being measures. Other than in yogis and trained meditators, little research has been done on mindfulness as a naturally occurring trait among non-practitioners. Though almost everyone has the capacity to be mindful, it has been shown that individuals differ in their propensity or willingness to be aware and to sustain attention to what is occurring in the present. Thus, the natural state of mindfulness varies between individuals. Baer et al. sought to investigate the factor structure of mindfulness by combining all items from preexisting mindfulness measures into a single questionnaire. Using factor analysis, it was found that mindfulness consisted of five facets, viz. observe, describe, act-aware, non-react, and non-judge. Studies have found a significant association between mindfulness and psychological well-being, anxiety, depression, alcohol/drug abuse, stress tolerance, and physical well-being among experienced mediators, general population, clinical (psychiatric) samples, patients with chronic illness, and terminally ill patients. [11,13,14] These studies have concluded that mindfulness as a quality is associated with optimal physical and psychological health. The lack of Indian studies on mindfulness especially among the medical profession is striking as mindfulness has its roots in the Indian tradition. The present study is the first step in addressing this lacuna. The aims of this present study are to explore the levels of mindfulness among medical students and to assess the association between various facets of mindfulness and psychological well-being as measured by depression, anxiety, and stress levels. The Five Facet Mindfulness Questionnaire (FFMQ) consists of 39 items, all measured on a Likert scale ranging from one (never or very rarely true) to five (very often or always true). The five facets assessed are a) observe, b) describe, c) act with awareness, d) non-react, and e) non-judge. These five facets have been shown to possess good internal consistency (0.72–0.92) with samples of meditators and non-meditators. The Depression Anxiety Stress Scales (DASS) is designed to assess the severity of core symptoms of depression, anxiety, and tension (or stress) over a period of time. It consists of three subscales of seven items each, assessing the severity and frequency of distress. The scores on DASS can be converted into ordinal categories ranging from none to extremely severe based on standardised cut-off scores. Minitab® statistical package was used for statistical analyses. One hundred and fifty students consented to participate in the study. None of the students had previous experience in formal mindfulness training or practices. The distribution of students in first, second, third, and final years of MBBS was 28.7%, 21.3%, 23.4%, and 26.6% respectively. 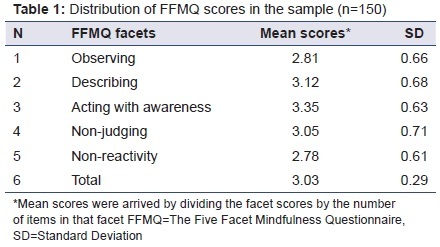 Table 1 illustrates the distribution of mindfulness scores on FFMQ for the entire sample. Students scored highest on the acting with awareness (mean 3.35, standard deviation [SD] 0.63) and lowest on non-reactivity (mean 2.78, SD 0.61) dimensions respectively. The mean scores of depression, anxiety, and stress subscales of DASS were 10.19 (SD 7.87), 11.15 (SD 6.98), and 13.19 (SD 6.55) respectively (Table 2). Spearman’s correlation (non-parametric test for non-normal distribution) revealed overall mindfulness scores to be significantly negatively correlated with depression (rho=-0.42, p-value 0.000), anxiety (rho=-0.33, p-value 0.001), and stress (rho=-0.26, p-value 0.010) subscales of DASS (Table 3). 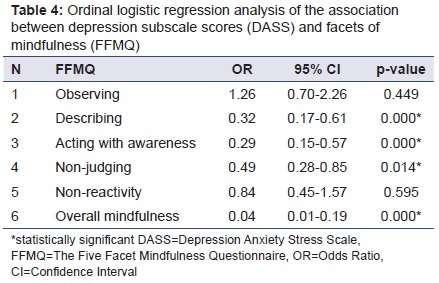 The association of dimensional facets of mindfulness with depression, anxiety, and stress was explored by ordinal logistic regression analysis using the cut-off scores of DASS subscales of depression, anxiety, and stress (none, mild, moderate, severe, and extremely severe) as response variables with the dimensional facets of FFMQ scale (Tables 4 to 6). The odds of having depression (DASS) was significantly lower in students who had high scores in describing (odds ration [OR] 0.32, 95% confidence interval [CI] 0.17-0.61, p=0.000), acting with awareness (OR 0.29, 95% CI 0.15-0.57, p=0.000), non-judging (OR 0.49, 95% CI 0.28-0.85, p=0.014) facets, and overall mindfulness (OR 0.04, 95% CI 0.01-0.19, p=0.000) in FFMQ. The non-reactivity facet did not show a statistically significant reduction in the odds (OR 0.84, 95% CI 0.45-1.57, p=0.595). 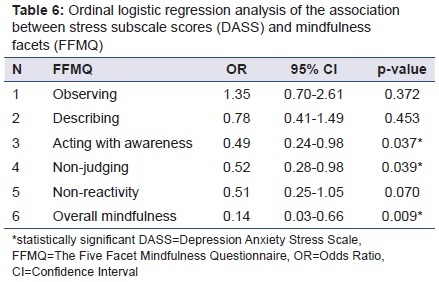 Interestingly, the odds of having depression was significantly higher in students who scored high in observing facet of mindfulness (OR 1.26, CI 0.70-2.26, p=0.449) (Table 4). The odds of experiencing anxiety (DASS) was significantly lower in students who had high scores in acting with awareness (OR 0.47, 95% CI 0.26-0.86, p=0.011) and non-judging (OR 0.44, 95% CI 0.26-0.76, p=0.004) facets, and overall mindfulness (OR 0.29, 95% CI 0.06-0.73, p=0.010) in FFMQ. Describing (OR 0.64, 95% CI 0.37-1.10, p=0.098) and non-reactivity (OR 0.75, 95% CI 0.41-1.35, p=0.35) facets did not show a statistically significant reduction in odds. 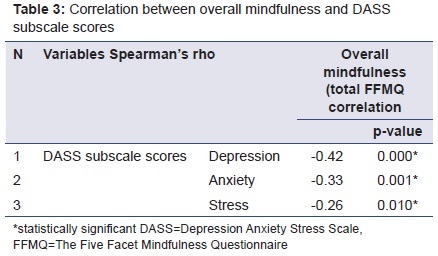 As noted with depression, the odds of having greater scores in anxiety was significantly higher in students who scored high in observing facet of mindfulness (OR 1.80, 95% CI 1.02-3.18, p=0.036) (Table 5). The odds of experiencing greater stress (DASS) was significantly lower in students who had high scores in acting with awareness (OR 0.49, 95% CI 0.24-0.98, p=0.037) and non-judging (OR 0.52, 95% CI 0.28-0.98, p=0.037) facets, and overall mindfulness (OR 0.14, 95% CI 0.03-0.66, p=0.009) in FFMQ. Describing (OR 0.78, 95% CI 0.41-1.49, p=0.453) and non-reactivity (OR 0.51, 95% CI 0.25-1.05, p=0.070) facets did not show a statistically significant reduction in odds. The odds of having high stress scores was greater in students who scored high in observing facet of mindfulness (OR 1.35, 95% CI 0.07-2.61, p=0.372), but unlike depression and anxiety they did not reach statistical significance (Table 6). To summarise, observing facet of mindfulness significantly predicted higher levels of depression and anxiety. Describing facet predicted significantly lower levels of depression. Facets of acting with awareness and non-judgement significantly predicted lower levels of depression, anxiety, and stress in the student sample. Non-reactivity facet predicted lower levels of all psychopathology studied, although the results did not reach statistical significance. The mean FFMQ scores (raw scores obtained by adding scores of all 39 items) of students in our study was 118.07 (SD 11.55). Other studies on student and non-meditating samples have reported FFMQ scores in this range. The main finding of our study was that overall mindfulness negatively correlated with depression, anxiety, and stress among students. Similar to our findings, McKee et al. and Bohlmeijer et al. have independently reported these associations. This is because being mindful enables one to objectively view thoughts and emotions, and thus take control of these mental phenomena. The alternative to being mindful is to live life on “auto-pilot” mode, i.e. unaware of how habits, immediate sensations, reflexive emotions run our lives. This leaves one a prey to changing life circumstances leading to avoidance, repression, or poor coping skills which in turn adds on to stress. Mindful living is vitally important to the medical student as the ability to cope successfully with the enormous demands of medical education has a direct impact on the future of the developing physician. Contrary to our expectations, we found that observing facet of mindfulness did not buffer against any form of psychopathology studied. Previous research on this facet also failed to show a protective effect on depression, anxiety, stress, and psychological well-being. Observing internal states with de-centered awareness should, in theory, increase the capacity to be less attached to negative thoughts, thereby protecting against anxiety. [26,27] One plausible explanation for this finding could be that our sample had low levels of observing coupled with low levels of non-reactivity (Table 1). To elaborate, observing could be counterproductive in the face of low non-reactivity, as it no longer allows for a distanced view of internal states, but rather heightens the cognitive and emotional reaction to distress. This could also explain why non-reactivity facet, which was the lowest at baseline, could not significantly predict any psychopathology examined. Students who had problems describing internal mental states in our study experienced more depressive symptoms. The inability to describe emotions and feelings (low describing facet), a central problem in alexithymia, leads to externalising these states to significant others, events, or objects, thus preventing exploration of negative states and healing within. Being mindful encourages one to describe internal states without bias leading to greater levels of metacognition and emotional intelligence, thereby serving to buffer negative affective states. The non-judgemental attitude seemed to emerge as an important facet of mindfulness in our results as it negatively correlated with all forms of psychopathology studied. Previous research has shown that higher non-judging to be related to lower levels of depression, anxiety, and stress. [12,14,29] The relationship between non-judging and depression is consistent with well-validated theories of depression in which self-criticism and negative cognition are hallmarks of the disorder. This ability to refrain from judging one’s own cognitions, emotions, and bodily sensations have been shown to buffer the effects of neuroticism, thought suppression, and experiential avoidance, all of which form the core of anxiety disorders and stress. Acting with awareness also emerged as an important facet of mindfulness in our study as it significantly predicted all three forms of psychopathology studied. Cash and Whittingham postulated that the ability to maintain awareness of ongoing activities would help the person to stay in touch with contextual cues and readily available sources of positive reinforcement in the environment; thus, keeping depressive symptoms at bay. The non-reactivity facet of mindfulness was negatively associated with depression, anxiety, and stress levels of students, though it did not reach statistical significance. Non-reactivity has been inconsistently related to depressive symptoms, with some studies showing no relationship,[14,31] while others showing either no association or opposite results. 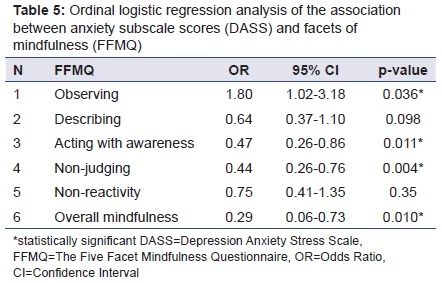 [24,32] This discrepancy could be explained by the fact that our sample had the lowest level of non-reactivity compared to the other facets of mindfulness (Table 1). The strengths of this study lie in assessing mindfulness in the medical profession, especially among students. Our finding that enhanced levels of mindfulness are associated with psychological well-being and lower levels of psychopathology is relevant in the present scenario where medical professionals are working in increasingly stressful situations. The cross-sectional study design is a limitation as it prevents any directional inference to be made. We can only infer that mindfulness is associated with (not caused) psychological well-being. As the main objective of the study was to investigate the association of mindfulness on psychological well-being, sociocultural factors were not studied (religion, economic status, etc.). However, these factors could have enriched our understanding of cultural influences on mindfulness. The stressful experiences of medical education negatively impact on the psychological well-being of students. Levels of depression, anxiety, and stress are high in medical school which impairs their optimal performance of future doctors. In this context, mindfulness, a qualitative dimension of conscious awareness, a naturally occurring trait, has been shown to buffer the adverse effects of stress and positively correlated with well-being and quality of life. Overall mindfulness and its facets like describing, acting with awareness, and non-judgement need to be cultivated formally by integrating them in the medical curriculum as mindfulness-based meditations, life skills training, and cognitive behaviour therapy aimed at preventing psychopathology and promoting mental health. Wilber K. Integral psychology: consciousness, spirit, psychology, therapy. Boston, MA: Shambhala Publications; 2000. Mace C. Mindfulness and mental health: therapy, theory and science. Routledge; 2007. Allen NB, Chambers R, Knight W; Melbourne Academic Mindfulness Interest Group. Mindfulness-based psychotherapies: a review of conceptual foundations, empirical evidence and practical considerations. Aust N Z J Psychiatry. 2006;40:285-94. Baer RA. Mindfulness training as a clinical intervention: a conceptual and empirical review. Clin Psychol. 2003;10:125-43. Chiesa A, Serretti A. Mindfulness-based interventions for chronic pain: a systematic review of the evidence. J Altern Complement Med. 2011;17:83-93. Gu J, Strauss C, Bond R, Cavanagh K. How do mindfulness-based cognitive therapy and mindfulness-based stress reduction improve mental health and wellbeing? A systematic review and meta-analysis of mediation studies. Clin Psychol Rev. 2015;37:1-12. Wupperman P, Neumann CS, Whitman JB, Axelrod SR. The role of mindfulness in borderline personality disorder features. J Nerv Ment Dis. 2009;197:766-71. Hayes SC, Strosahl KD, Wilson KG. Acceptance and commitment therapy: an experiential approach to behavior change. New York: Guilford Press; 1999. Gotink RA, Chu P, Busschbach JJ, Benson H, Fricchione GL, Hunink MG. Standardised mindfulness-based interventions in healthcare: an overview of systematic reviews and meta-analyses of RCTs. PLoS One. 2015;10:e0124344. Kabat-Zinn J. Full catastrophe living (revised edition): using the wisdom of your body and mind to face stress, pain, and illness. Random House Publishing Group; 2013. Baer RA, Smith GT, Hopkins J, Krietemeyer J, Toney L. Using self-report assessment methods to explore facets of mindfulness. Assessment. 2006;13:27-45. Baer RA, Smith GT, Lykins E, Button D, Krietemeyer J, Sauer S, et al. Construct validity of the five facet mindfulness questionnaire in meditating and nonmeditating samples. Assessment. 2008;15:329-42. Cash M, Whittingham K. What facets of mindfulness contribute to psychological well-being and depressive, anxious, and stress-related symptomatology? Mindfulness. 2010;1:177-82. Tyssen R, Vaglum P, Grønvold NT, Ekeberg O. Suicidal ideation among medical students and young physicians: a nationwide and prospective study of prevalence and predictors. J Affect Disord. 2001;64:69-79. Shapiro SL, Schwartz GE, Bonner G. Effects of mindfulness-based stress reduction on medical and premedical students. J Behav Med. 1998;21:581-99. Rosenzweig S, Reibel DK, Greeson JM, Brainard GC, Hojat M. Mindfulness-based stress reduction lowers psychological distress in medical students. Teach Learn Med. 2003;15:88-92. Lovibond PF, Lovibond SH. The structure of negative emotional states: comparison of the Depression Anxiety Stress Scales (DASS) with the Beck Depression and Anxiety Inventories. Behav Res Ther. 1995;33:335-43. Henry JD, Crawford JR. The short-form version of the Depression Anxiety Stress Scales (DASS-21): construct validity and normative data in a large non-clinical sample. Br J Clin Psychol. 2005;44:227-39. Minitab 17 Statistical Software. State College, PA: Minitab, Inc.; 2010. Van Dam NT, Earleywine M, Danoff-Burg S. Differential item function across meditators and non-meditators on the Five Facet Mindfulness Questionnaire. Pers Individ Dif. 2009;47:516-21. McKee L, Zvolensky MJ, Solomon SE, Bernstein A, Leen-Feldner E. Emotional-vulnerability and mindfulness: a preliminary test of associations among negative affectivity, anxiety sensitivity, and mindfulness skills. Cogn Behav Ther. 2007;36:91-101. Bohlmeijer E, ten Klooster PM, Fledderus M, Veehof M, Baer R. Psychometric properties of the five facet mindfulness questionnaire in depressed adults and development of a short form. Assessment. 2011;18:308-20. Williams JM, Swales M. The use of mindfulness-based approaches for suicidal patients. Arch Suicide Res. 2004;8:315-29. Breslin FC, Zack M, McMain S. An information-processing analysis of mindfulness: implications for relapse prevention in the treatment of substance abuse. Clin Psychol. 2002;9:275-99. Craske MG, Hazlett-Stevens H. Facilitating symptom reduction and behavior change in GAD: the issue of control. Clin Psychol. 2002;9:69-75. Haviland MG, Shaw DG, MacMurray JP, Cummings MA. Validation of the Toronto Alexithymia Scale with substance abusers. Psychother Psychosom. 1988;50:81-7. Barnhofer T, Duggan DS, Griffith JW. Dispositional mindfulness moderates the relation between neuroticism and depressive symptoms. Pers Individ Dif. 2011;51:958-62. Abramson LY, Alloy LB, Hankin BL, Haeffel GJ, MacCoon D, Gibb BE. Cognitive vulnerability-stress models of depression in a self-regulatory and psychobiological context. In: Gotlib IH, Hammen C, editors. Handbook of depression. New York: The Guilford Press; 2002:295-313. Desrosiers A, Donalds R, Anderson M, Itzoe M, Britton W. School based mindfulness training may offer clinical benefits. Boston, MA: World Congress of Behavioral and Cognitive Therapy; 2010. Christopher MS, Neuser NJ, Michael PG, Baitmangalkar A. Exploring the psychometric properties of the Five Facet Mindfulness Questionnaire. Mindfulness. 2012;3:124-31. Sampath H, Biswas AG, Soohinda G, Dutta S. Mindfulness and its role in psychological well-being among medical college students. Open J Psychiatry Allied Sci. 2019;10:52-6. doi: 10.5958/2394-2061.2019.00013.2. Epub 2018 Nov 26.